Welcome to the North Peace Navigators Hockey Club and the "Thrill of a Lifetime" Exhibition Game between the Montreal Canadiens Alumni Team and the North Peace Old Timers. Montreal Canadiens Alumni Exhibition Game - Sunday February 9th at 12:30 PM - Baytex Energy Centre. Tickets will be available at the door. Our arena holds 1292 people so we have room for everyone. Gather up your friends and family. Try your luck on the 50/50 Draw. Try your skill at the Tire Toss. Buy some Montreal Souvenirs. 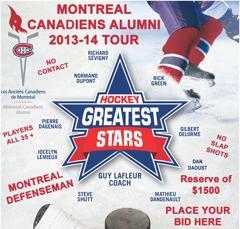 Check out the Silent Auction which includes a hockey stick signed by the Montreal Canadiens Alumni Team, NHL Prints, Replica Stanley Cup Rings, A Youth Hockey Helmet, Home Decor Hockey Boards, a Load of Spruce Logs and North Peace Old Timers Jerseys signed by the Montreal Canadiens Alumni Team. We even have a program from the 1984 Habs VS Davis Diggers Game held here in Peace River and it has autographs. See you there. Good Luck To All The Players !! !